This Table Skirt is Ideal for Trade Shows and Banquet Halls! This Tablecloth Covers all Sides of an 8' Long Table! 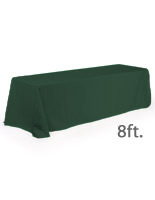 Designed to cover all (4) sides of 8' x 30" x 30" tables. Made from 100% polyester for durability & wrinkle resistance. White fabric is perfect for use in any environment. A table skirt, also called a table cover has four rounded corners that ensure that it completely covers an entire table without having extra fabric in the corners. When placed appropriately, the table cover drapes beautifully to the ground. 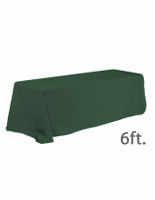 The fabric covers all 4 sides of the table permitting you to discreetly hide supplemental boxes and accessories below. Embellish your booth's look and display with this great tablecloth! 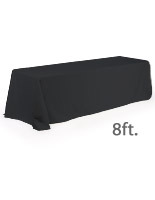 Our company sells this table skirt in a 6-foot dimension as well. To make a more exquisite exhibit, add table runners to this table cover. Leave a lasting good impressions by using this elegantly durable table cover! 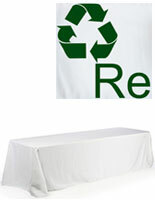 This table skirt, also known as a throw or linen, is the perfect cover for any table at a catered event or trade show. The solid, vibrant white cover grabs the attention of everyone that passes by. When used in a trade show, it ensures your booth will be seen. When used at a catered event, it improves the ambiance in the room creating a custom, put-together look. Produced from polyester fabric, this table cover is machine–washable, enabling it to be washed easily when it gets dirty. 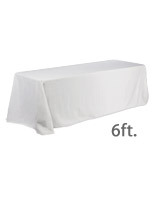 A table cover, like linen table throws, is engineered to cover 8'w x 30"h x 30"d tables. In lieu of utilizing a bare folding table at your next occasion, dress them up utilizing the table cover for a more expert and uniformed look! A table cover changes your dull folding table into appealing display furniture effortlessly and immediately!